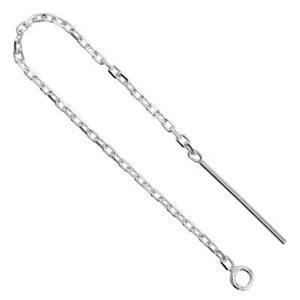 Sterling Silver 78mm 22 gauge Diamond Cut Cable Ear Threader Findings, 1.2mm Chain, 1.5mm Open Ring ID. Order 2pcs to make one pair of earrings. Long cable chain ear thread earring findings are 3 inches long overall. Once you add your design embellishments, this will be a show stopping shoulder duster! Ear threads add visual interest both in front and behind the ear. A great choice for making statement earrings or asymmetrical interpretations.